Integrated Storage Solutions offers the latest high-quality, top-performance tape drive solutions. 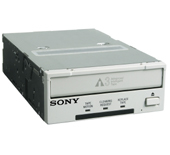 We carry tape drives by Sony, Quantum, Hewlett-Packard, STK, and many others. These drives are available configured as either turnkey external storage subsystems or bare devices ready for installation into servers or existing storage subsystems. We work with you to find the best solution for your needs and budget. Please contact us if you have questions or would like to discuss your tape drive storage needs.